Human CellExp™ IL-1 Alpha, human recombinant | 7275 | BioVision, Inc.
Lyophilized from 0.22 μm filtered solution in in PBS, pH 7.4. Generally 5-8% Mannitol or trehalose is added as a protectant before lyophilization. The bio-activity was determined by dose-dependent stimulation of the proliferation of mouse D10S cells. The ED50 <1pg/ml, corresponding to a specific activity of >1X10^9 Unit/mg. 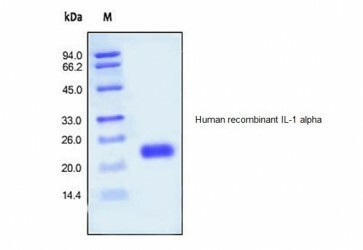 Interleukin-1 alpha (IL1a) is also known as IL-1A, IL1, IL1-ALPHA, IL1F1, and is a cytokine of the interleukin-1 family. IL1a possesses a wide spectrum of metabolic, physiological, haematopoietic activities, and plays one of the central roles in the regulation of the immune responses. It binds to the interleukin-1 receptor. IL-1α is constitutively produced by epithelial cells. It is found in substantial amounts in normal human epidermis and is distributed in a 1:1 ratio between living epidermal cells and stratum corneum. The constitutive production of large amounts of IL-1α precursor by healthy epidermal keratinocytes interfere with the important role of IL-1α in immune responses, assuming skin as a barrier, which prevents the entry of pathogenic microorganisms into the body. In vitro, IL-1α possesses biological effect on cells in the picomolar to femtomolar range. In vivo, shortly after an onset of an infection into organism, IL-1α activates a set of immune system response processes.